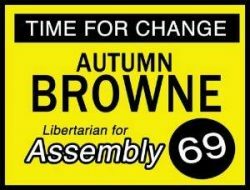 After much consideration and discussion with my family, and due to recent health issues, I have decided to suspend my campaign for the 73rd Assembly District. I recently had a serious fall that caused a head injury, and will require an extended recovery that has been making it difficult to run a campaign. At this time I cannot continue to put the effort in to the race that will make my campaign successful. Therefore, I have decided to suspend my campaign. I’ve spent over 30 years working for the people of Laguna Niguel and Orange County. But at this time, I have decided it is best to dedicate more time to my recovery – and when my health returns, to my family and to helping our local communities. After deciding to withdraw, it was clear who to support—Anna Bryson. Anna has done so much for this community as an education reformer and leader. She will make a great Assemblymember. I would like to thank so many people who have worked and supported me during this campaign. I strongly encourage them to support Anna Bryson and keep this seat in GOP hands in November. Paul was elected to the Laguna Niguel City Council in 2004, serving as the city’s Mayor in 2008 and in 2012. In December of 2006, Paul joined the Orange County Transportation Authority Board of Directors where he represented South Orange County’s Fifth District and was a member of the Regional Planning and Highways Committee. He served as Chairman of the Board in 2012. Currently, Paul and his wife, Janice, own their own small business, Glaab and Associates, a public affairs firm in Orange County which Paul founded in 1999. He and Janice reside in Laguna Niguel where they are raising their daughter, Molly, who attends St. Anne School in Laguna Niguel. Head injury? WTF? That didn’t stop 90% of our legislature.